Search Minerals Discovers HREE-Zr-Y… | Search Minerals Inc.
VANCOUVER, March 1, 2012 /CNW/ - Search Minerals Inc. (“Search” or the “Company”) (TSXV: SMY) and its wholly-owned subsidiary, Alterra Resources Inc., confirm the discovery of mineralization on the Pesky Hill heavy rare earth element (HREE)-Zr-Y-Nb prospect in the Port Hope Simpson REE District in SE Labrador. Channel samples from this prospect reveal high concentrations of Dy, Tb, Nb, Zr, and Y. A 2000 m Diamond Drill Hole Program has been proposed for Q2, 2012. The Pesky Hill Prospect occurs in the HighREE Hills REE Belt, which is currently 13 km long and 2 km wide. The prospect (Figure 1) is 1.5 km from tide-water, 33 km from the ice-free, deep water port of St.Lewis, and is 5 km from highway 510, an all season gravel highway. The rare earth mineralization, consisting of fergusonite, allanite, and zircon, occurs in amphibole bearing granitic pegmatites. Mineralized pegmatite veins vary in size up to 15m in width and form a discontinuous zone, in outcrop, over 200m. Dy, in sample channels, ranges from 621 to 2751 ppm, Tb from 91 to 365 ppm and Y from 2963 to 12522 ppm. Nb ranges from 3667 to 21693 and Zr ranges from 5512 to 16557. Nd, a target light rare earth element, ranges from 1502 to 3474 ppm. The best channel sample gives 621 ppm Dy, 1534 ppm Nd, 91 ppm Tb and 2963 ppm Y over 14.69m. This mineralization is characterized as HREE mineralization with HREE/Total REE ranging up to 53.5% and HREE+Y/Total REE+Y ranging up to 74%. Table 1 outlines assay data from 4 different channels (six intervals) collected from the Pesky Hill Prospect. Analytical techniques, sample preparation, and channel sampling procedures are outlined in Search’s July 27, 2010 and September 8, 2010 news releases. Exploration continues in this belt and adjacent portions of the Port Hope Simpson REE District and will include prospecting, additional sample collection, channel sampling, and geological mapping. A 2000 m diamond drill program is proposed for Q2, 2012 at the Pesky Hill Prospect. Table 1 REE, Y, Zr and Nb Data from Channel Sample Intervals, Pesky Hill Prospect. The Port Hope Simpson REE District is 135 km long and 4 - 12 km wide, consists of 4326 claims in 86 licenses, and occupies 1081 square kilometres. There are a total of 9 REE prospects in the District, including: Rock Rolling Hill, Rattling Bog Hill, Piperstock Hill, Southern Shore, Toots Cove, Pesky Hill, HighREE Island, Foxtrot and Ocean View. 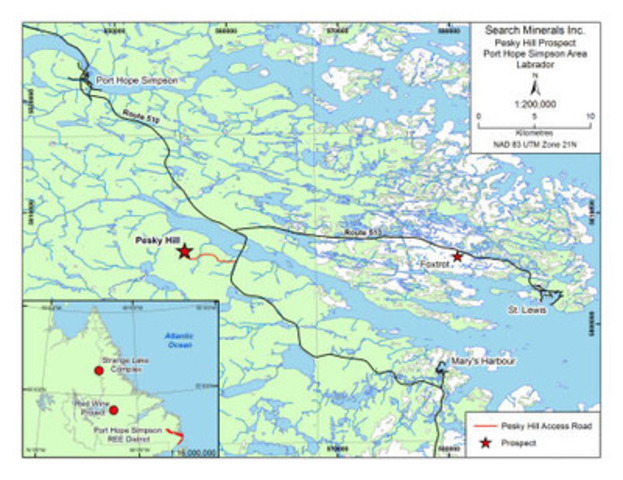 The Foxtrot Project occurs in the Fox Harbour mineralized belt. Piperstock Hill, Southern Shore, Toots Cove and Pesky Hill occur in a 13 km mineralized zone known as the HighREE Hills. The Ocean View Prospect occurs in a 3 km mineralized zone known as the Ocean View mineralized belt. The Fox Harbour, Ocean View and HighREE Hills mineralized zones are considered very prospective for both HREEs and LREEs.